It's all about the little things…Sharing some of my favorite photos, recipes and memories. 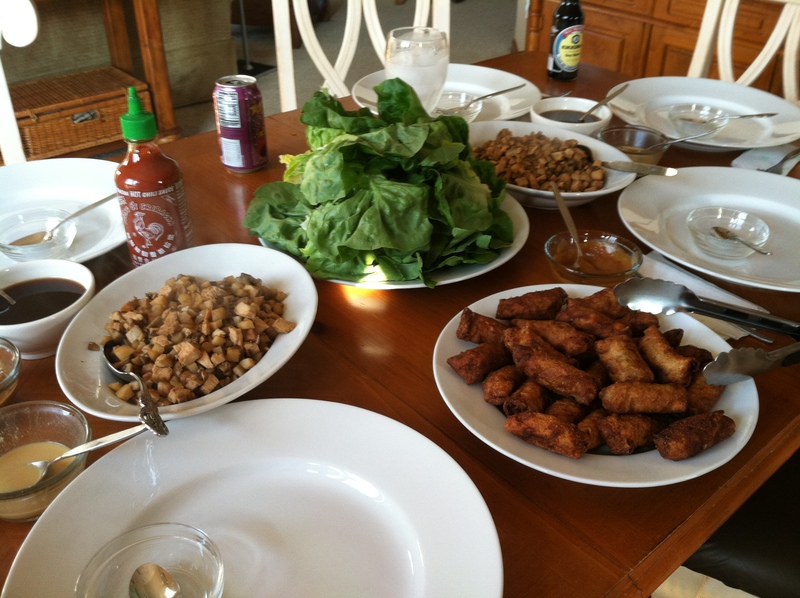 We love to try different cuisines at our house, especially asian-inspired dishes. In fact, we love it so much that we have an entire kitchen cabinet dedicated to Asian cooking. Can you say yum? So, since we had extra water chestnuts on hand, and a package of wonton wrappers (because who doesn’t have these on-hand all of the time?!? 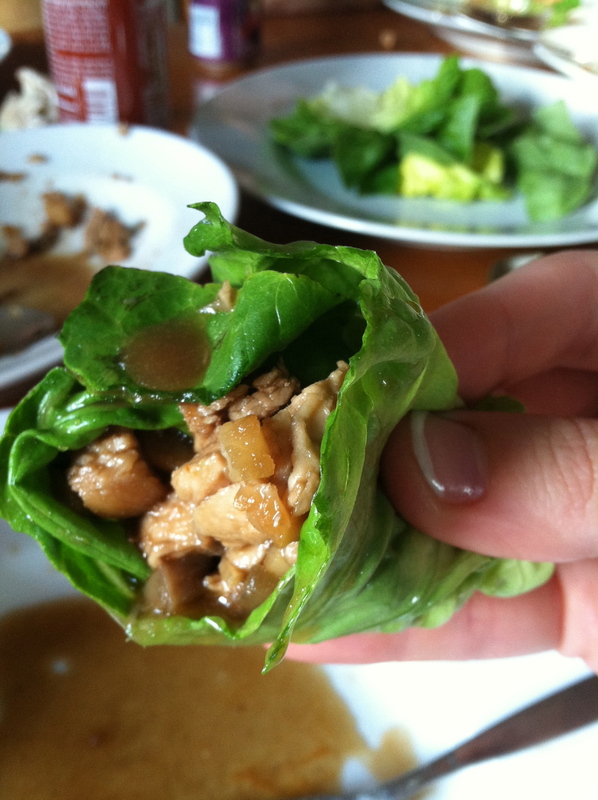 ), we quickly settled on making Chicken Lettuce Wraps inspired from P.F. Chang’s, along with some Pork Egg Rolls from a recipe I got from a friend a while back. The combination not only looked great spread out on our dining room table, but it tasted wonderful as well. The egg rolls make a great party appetizer too! Are you hungry enough to cook yourself yet? Make the special sauce by dissolving sugar in water in a small bowl. Add soy sauce, rice wine vinegar, ketchup, lemon juice and sesame oil. Mix well and refrigerate the sauce until you’re ready to serve. Combine the hot water with the mustard and set this aside as well. You’ll eventually add your desired measurement of mustard, and garlic chili sauce to the special sauce mixture to pour over the wraps or dip them in. Bring oil to high heat in a wok or large frying pan. Saute chicken breasts for 4-5 minutes on each side, or until done. Remove chicken from the pan and cool. Meanwhile, mince the water chestnuts and mushrooms to the size of small peas. Prepare the stir fry sauce by mixing the soy sauce, brown sugar and rice vinegar together in a small bowl. When chicken is cool, mince it the same size as the mushrooms and water chestnuts. Turn your pan on high heat, add another Tbsp of oil. Add the chicken, garlic, onions, water chestnuts and mushrooms to the pan. Add the stir fry sauce to the pan and sauté the mixture for a few minutes until everything is evenly heated and mixed. Serve chicken mixture in lettuce “cups” and top or dip with your mixture of special sauce. Mix the turkey, vegetables, water chestnuts and soy sauce by hand in a large mixing bowl. Whisk egg in a bowl to use on edges of wontons to get a clean seal. Take a teaspoon of the mixture and place it at one corner of the wrapper. Fry, approximately 3-4 minutes, to cook. Serve with a dipping sauce of your choice. A peanut sauce goes well. My mobile office is better than yours! How I got my groove back!